So, I managed to complete Camp NaNoWriMo. Let me tell you, it was a task. Crazy head full of ideas, but getting them out of the head and on to the page was an entirely other matter. In other news, well, there isnt much other news. Not at the time. Things are just ambling along at a snails pace. I find myself flip flopping on what I want to do at any given time. I have made some purchases for myself lately, however. Mostly books…whodathunkit? I did managed to find this ADORABLE trinket box that looks like an old fashioned tyepwriter. I’ll snaps some pics when it comes in. I also found a coaster set that looks like an old timey typewriter as well. I love the look of old time typewriters, but honestly, I wouldnt want one. I wouldnt use it. I love my PC and laptops. Besides, if I ever get that craving some writers do to hear the clickity clack and dings of a real typewriter, I have a program for that. Sometimes I turn it on when writing. Only thing is, I forget to turn it off and striking any key will clank, and its worse when I put my headphones on. Yeah, it can be loud. The kittehs are all doing well. Terrible as always. The daughter is doing well, too. Also terrible. I had lunch last week with my lovely friend Stephanie down in Dothan. It was great, and getting out of my safety zone and talking with someone face to face was so nice. I had been feeling burdened, or low, and that perked me right up. Well, off for now. This Alabama heat is killing me. It wouldnt be so bad if it werent so humid! Love and squishes my dears! I managed to beat my own goal by doubling it. That was certainly a surprise. Maybe I will use the same tactic in July’s Camp NaNo. It’s that time of year again! 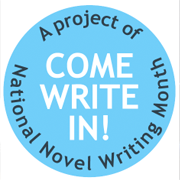 Camp NaNoWriMo 2016, the first of two. This Camp I have set a really small word goal…15,000 words. I am going to focus on short stories, the theme being supernatural and horror. I plan on posting what I write up daily here to the blog, so keep an eye out! Hopefully I’ll manage some pretty entertaining things. In other news…Quinn is adapting to her new home here. She gets along really well with Jeffrey Jones, but, Jeffrey is a pretty chill sort of guy. Things with BaxterMarie can get a little tense, however. There was a lot of poofing and hissing and growling going on, but that has eased up. Baxter is TRYING to make friends, but Quinn is still a little iffy and tends to hiss and retreat. Oh…remember I broke my foot? I did it again. I swear, my poor foot is going to fall off at some point. I went to see my doctor and she looked at it, said I should probably go back to the bone and joint specialist again for possible surgery. I told her I thought the specialist was a quack. Nice guy and all…but a quack. The daughter demon spawn of mine is doing well. She has discovered yoga and loves it. She goes to a non profit (they take donations and she is out of a job currently) place and really enjoys it. She even dragged her father creature with her. I guess he thought it was okay, but he hasnt gone back…lol. ME? NOPE. GOOD NEWS! My mommy and daddy are coming up from Guatemala for a little visit. Its time for them to renew their (retiree) military IDs and they want to get a few legal things taken care of. My dad is going to go see his family up north, too, while my mom gets fought over between me and my older sister…lol. All in all, its going to be nice. So, thats the dealio. Look out for some short stories coming in April. I’ll probably do the same thing again for the July Camp NaNo, though with a higher daily word count. The zephyr of warm air washed over his face, giving him pause to smile. It felt wonderful. Life was good. It could only get better from here. That is, if his flock never discovered his secret. Such a primal beast he was. A devil, a demon, from what books would describe. He had learned to blend in. Look and act human. His base instincts were still there, but he taught himself control. There, in the labyrinth of tunnels in the city, the homeless, runaways, the discarded humans seemed to accept him as one of their own. He started providing for them. They needed food and water. He provided those things. Of course, you couldn’t make an omelet without breaking a few eggs. He used this new community he had integrated himself into. He stole from those he killed. In turn, he pawned the items for money. He needed to be able to blend in with the world above, as well as below. He had to look respectable by society’s standards. He tried not to harm those under his care. He hunted those above ground instead. The wealthy. He did so in a way that the police would not give much thought to. As he sat around the fire one night, a small human child came to him, sitting on his lap. She placed her hand on his face. A soft touch. The gentle touch of a defenseless child. He smiled to her, pulling a piece of meat from the makeshift spit, blowing on it lightly to cool it before handing it to the little one. He was making a race of cannibals. They didn’t need to know that. They just needed to look into his face and see their god.